SURELY, love has this uncanny knack of finding its way. Otherwise how can those who have never met or known each other, are culturally different and live diagonally across the globe become life partners? For some, it’s love that culminates in marriage eventually, while for others it’s the motions of arranged marriage that make them tie the knot. In the latter, love is the fruit of marriage in 70 per cent of the cases—at least in India. Arranged marriages happened in the past either through matrimonial columns in newspapers or through vicholaas, priests and common friends. That was the 20th century, when the e-era had not set in and matrimonial portals were unheard of. It’s cyber age now and Lee’s discovery, the Internet, is percolating down into everyone’s (personal) life, directly or indirectly. It is even ‘quick-fixing’ suitable matches. All eligible Netizens, beware! Get set to be engaged through the WWW. Cupid’s arrow has taken the shape of a mouse cursor and the god of love has discovered the novel route(r). This time he is talking in terms of hit rates, Web browsers and http:// addresses, courtesy matrimonial portals. No longer is the Net for the chatting-setting-dating flirtatious regimen that used to get sombre just once in a blue moon. It is getting more committed now. Matrimonial portals that survived the dot.com crash are now producing results…and happily married couples. Log on and get married. It’s happening now. Take the case of Sham Sharma, for instance. He belongs to a middle-class family of Gokalgarh village, Ambala district. Since he did not have a PC at home, he used to frequent a cyber café near his village on the Ambala-Jagadhari road. "Here while browsing, I met Roshni, my wife, at a matrimonial site (www.a1im.com). We became good friends and after long chat sessions concluded that we could be a good husband and wife. So we finally decided to tie the knot in court on March 28," he says. Then off he went to New Zealand. "We are going to get married traditionally on June 29, 2002, in Skipton Hall, Auckland," he told Login Tribune. His wife, a Fiji national, works as an accounts officer in one of the New Zealand government’s health organisations. "I thank the cyber era which played a very important role in bringing us together," he says. With Net playing the pivotal role, caste, creed and culture have vanished into thin air, as is evident from what Anand, an IT professional who is now happily married to a girl of his liking, underwent. Anand was actually searching for e-friends when he bumped into Archana. Today beyond the barriers of territory, culture, language and distance, they are husband and wife. Before they met, they were hundreds of kilometres away in Chennai and Mumbai. "It all happened when I logged on to a matrimonial portal, matrimonialonline.com, one fine afternoon. My search returned seven names, out of which I chose Archana," reminiscences Anand. "Little did we know then that this would be the best choice of our lives. We started on casual mails exchanging design ideas as we were then in the same field professionally. During the long absence of mail from my side for a particular period of time, she became worried and missed me. It just happened that I had given her my telephone number in one of the earlier mails. She called me at my home and found me to be ill. After that she kept sending me get-well cards till I recovered. My recovery was fast indeed! The day I got back to office, we also got back to exchanging long mails, apart from the chat sessions. It was after four months that we decided to meet and she came to Chennai to visit me. We had resolved our love and marriage even before we met. Now I have got a job in Mumbai and moved there to be close to her, but since my firm is moving to Manipal following a merger, we are getting married immediately. We are starting our life in a beautiful place. With IT as my profession we are hoping for a great life ahead. Though this may sound like a fairy tale, we had lots of problems in getting to this point as we are marrying across cultures and religions. But whatever has happened is a nice beginning," he opines. 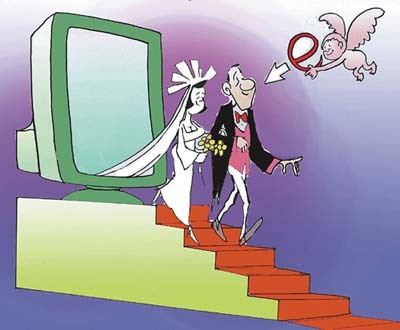 The Net as a medium for matrimony has taken off in a big way. There are several advantages in choosing the Net. "Ease of input, no constraint of space as each profile gets a full page, ease in communication as e-mail is instant and free, option of sending photographs, ease in searching as per various criteria like age, caste, height, etc, all profiles of different regions, viz. South and North Indians at one place, which the print media does not have, are important issues in making the Net an ideal media for matrimony. It is especially useful for NRIs who constitute 30-35 per cent of the visitors on most of the portals," points out Amit Tandon of an online matrimonial portal, jeevansathi.com, that boasts of 1,02,000 matrimonial listings, over 9,000 photographs and over 6 million page views a month. Padmanabhan Karatha, CEO, www.jiljil.com, a marriage portal, says most of the Internet matrimonial sites do not survive off advertisements. "The portals give value added services to customers for a nominal fee. When you look at it, you may spend lots of money in just locating the suitable match. Here for a nominal fee of $10-$30, you can find the bride and groom you are looking for and even chat with each other and get to know your potential partners better before proceeding further," he says. Another benefit of the Net serving as a matrimonial medium is the online chat option on ‘marital’ portals. Chat is instant and inexpensive. Above all, it’s reliable as the answers a person gets are spontaneous and on the spur of the moment. This reduces the chances of someone posing as what he or she isn’t. This way the would-be bride is able to judge whether the person on the other side of the screen is of her ‘type’ or not. Initial contact is mostly through e-mail and, thereafter, online chat becomes a routine affair. Almost de rigueur. Such is the power of chat that Suresh Ganapathy, CEO, MartimonialOnline.com, another portal dealing in ‘match-fixing,’ is in the process of developing a powerful chat feature, which would be available by the year end. "We have received plenty of feedback from people who met through our site, indulged in chat for 1-2 months, met and then got engaged or married," Tandon says. Take the case of Dr Rinku Dey, Medical Officer, ARC, Cuttack, and Dr Partho Dhang, R&D Manager, Singapore, who got married within three days of meeting each other, physically. All this because they had become chat friends and knew each other’s nature, already. They discovered each other at a marriage portal in April 2001. Later, they became chat friends. Then they fell in love on the Net without seeing each other. Finally, they met each other physically on December 25, 2001, and got married on December 28 —in three days flat. "We are amazed and extremely happy to say that such serious love and marriage can be solemnised through portals. But for it, we would have missed each other totally," they comment. Earlier, when the Net was slowly creeping into our lives, it was thought that a person went to the Web for marriage as a last option. Today the mind-set has undergone a sea change. Sites like matrimonialonline claim to have grown 150 per cent during the past one year alone, indicating that there has been a paradigm shift in the market sentiment. "Over 50 per cent of our customers are less than 26 years of age, which hardly indicates that the Net is a last ditch resort," avers Mittal. "These days, it is not the last option but one of the most important options, which is nowadays used like multilevel marketing. So whether a parent or bride or groom, try all modes and wait to see which clicks faster and gets response, obviously it's the Net, which gains the level because of its inherent advantage. Giving advertisement in the newspaper is more costly than registering your profile in matrimonial site," says Rohit Misra, counsellor, www.asianmatches.com, a site that claims to fix 20 alliances a month. The reasons why so many of lonely hearts are finding a mate through the mouse are not hard to seek. Local matrimonial agents or marriage brokers have just a few hundred alliances with them, whereas an established matrimonial Web service may have close to 1,00,000 profiles from 500 countries and regions around the world with the unique feature of displaying the mate seeker’s pictures. It’s both economical and advantageous to search a match through the Web. The charges are competitive and the profile registration, modification, picture scan and attachment to the profile are free. Add to it the advantage of viewing each other’s picture and exchange of other details through e-mail in a few hours. Remember, in the cyber age grooms and brides look for the best matches. They do not want to compromise on their dream partner's selection, which is a landmark in anyone’s life. They are prepared to marry a person from anywhere around the world, as long as the requirement matches. Only Web-based matrimonial agencies can cater to such needs. "Matrimonial portals are a good medium for NRIs since they can browse various marriage portals until they find a match. Newspaper is another medium, but is mostly for those readers who are not Net-savvy. The young generation is using the Web extensively to get to know about possible prospects. I believe it’s just a matter of few years when this would become the prime medium, just like newspapers are today," avers Sandesh Sharda, president, www.cyberproposal.com, the site that claims to have the maximum number of NRI proposals. Here is what Satish, an NRI settled in the USA, says to the portal managers after getting married to Gita from India: "I would like to thank you for your wonderful site (www.jeevansathi.com) that has allowed me to connect with my soul mate. I put my ad on your site in Jan 2002 and immediately received seven very qualified motivated responses of the highest order. Gita responded on Jan 24, 2002. I proposed to her from 12,000 miles (USA) away on February 12, 2002. On March 9, 2002, we were married in a Vedic ceremony. Without your site there is no way under the heavens I would have found my soul mate. We lived in different worlds and our paths would have never crossed, but your site allowed us to connect." Love is also re-igniting for not-so-lucky-the-first-time through the Net. Vince Cassettare, 42-year-old widower with a 19-year-old daughter, who lives in Surrey, UK, recalls how life in him was rekindled when he ‘discovered’ Linda. "I was drawn to her in the chat room. She was intelligent, witty and expressed a love of the UK, my home. She was from California, a part of the USA I had never seen but was interested in." Soon their chats became a routine. "We chatted and hours vanished. I had been married and dated countless times in my then 40 years of life, but never had someone taking my interest so completely as this stranger from across the sea. We discussed everything, our likes, dislikes, our troubles and our pleasures; the more we talked the more amazed we became at how much we had in common. We both admitted that we had feelings for each other and our friendship became far greater. Then came the time that anyone who’s ever had an Internet relationship will know. The meeting. A week later I found myself on a plane winging my way to San Diego. And we fell head over heels in love. I returned home, and missed her like crazy, the online chat now seeming so pale in comparison with holding the woman I loved in my arms. I finally asked her to marry me and she agreed having discussed the fact she wanted to move to the UK to be with me," Vince says. Such is the popularity of online marriage vortals and portals that most of the new sites are providing this option. "I have a friend who is going to marry a girl whom he met through a matrimonial site. Then they started chatting through the Internet and after one year they met each other. Finally they are going to marry. In fact, my friend’s story has inspired me to put a matrimonial link on my Website, www.australiandesi.com," says Toshit Bhardwaj, a software developer who has created a portal for students wishing to study in Australia. It’s not always that chats end up in fairytale romance and marriage. There are cases where things end up in an anti-climax. James (screen name), an IT pro who had plans to marry Net style, was stupefied when he actually met the girl with whom he had spent long hours chatting. "She was not one of the God’s finest creations, to put it very mildly," he says, and confesses that he ran away from the rendezvous as fast as his legs could carry him. He now plans to move through newspaper columns and vows never to chat with the motive of marriage. Despite such aberrations, matrimonies through portals are gaining currency. An old cliché may soon be modified to "marriages are made in cyberspace and solemnised through portals." A wish for those who got married e-style: A happy married life. For those who are sceptical — Do try it out, it just might work out.